Easter Road legend Pat Stanton, the figurehead for a fans’ group intent on ousting the current Hibs board, has backed plans to turn over 51 per cent of the Leith club to supporters. 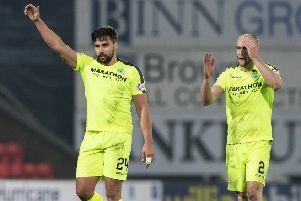 Stanton was one of those calling for change when BuyHibs launched its bid in November, the former Hibs player and manager having also appeared at a rally in the immediate wake of the club’s relegation to the Championship at the end of last season calling for chairman Rod Petrie to go. But now he has revealed he is happy with plans which will give fans the opportunity to buy shares – the proceeds of which will go directly into the club – and which leave Hibs free of bank debt. Urging supporters to give the proposals their backing, he said: “A lot of people have come forward since relegation, and they’ve done so because they care passionately about our club. “A lot has been said, and now is the time to get behind the team and support this plan. As far as I am concerned, the plan gives people what they have been telling me they want, a much greater stake in their club. I am particularly delighted that the stadium and training centre will remain in the ownership of the club, and therefore the supporters. I’d urge supporters to look at what is being proposed, and I think they will find it to their liking.